Scattergories is a fun and popular game and you need a scattergories die to play this game. 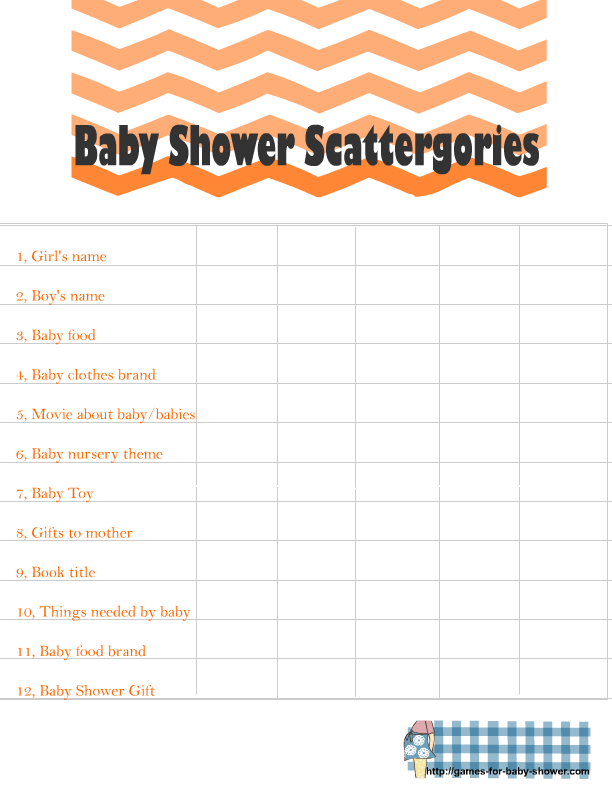 On this page Baby Shower Scattergories Free Printable Game that has baby related categories. You can download this game in the color of your choice and play at your baby shower party. How to Play: Give one card to each of your guests and something to write with. If you have a die then use that otherwise draw an alphabet from the scrabble tiles and ask the guest to make a word with that letter for all the scattergories categories. You can draw up to 5 different letters. The person who makes words for most of the categories will be the winner. This is the first free printable sheet that I have prepared for this scattergories game. It has 12 different categories, so guests will have to come up with something for the each category. This game card is decorated with a blue and white chevron pattern. To save this game just click on the thumbnail image and then print or save the bigger image that will open up. This is another color for this scattergories game. This orange color is gender-neutral so you can print this game if the parents-to-be do not know or do not want to reveal the gender of the baby. This adorable scattergories game is decorated with a pink and white chevron pattern. To save this game just click on the thumbnail image that I have shared above and then right click and save the bigger image.